On Mountain or Backcountry Skis? I’m looking forward to creating more of this kind of magic with you this season! A sun-seeking Californian discovers a whole new world of adventure travel in the snow. I decided to hate broccoli when I was seven. It wasn’t the taste or the texture; I choose to hate broccoli for no reason at all. Similarly, I once made up my mind to hate all snow sports. It wasn’t a completely baseless decision, but it only took two failed attempts at snowboarding to crush my competitive ego and sour me to all snow-related activities. While I eventually came around to broccoli, I’ve remained adamant that any mountain-based travel has to take place in the summer. So when my editor told me I was going to Telluride—a destination that makes ski enthusiasts salivate—I was baffled. “You know I hate snow, right?” There must be some mistake. As it turns out, youthful stubbornness doesn’t matter much in the workplace, and I packed my bags for a snowy adventure. A free gondola connecting the two makes everything in the area ski-adjacent, but when we pulled up to the Madeline Hotel and Residences in Mountain Village, it became clear that I would be practically sleeping on the slopes.I prepared for a day of face planting by layering two pairs of Point6 socks, a SmartWool base layer, and fleece leggings under my snow pants. “Actually, the only thing you want inside your boot is your sock—one sock,” the expert at the Bootdoctors rental shop laughed as he handed me a pair of boots to try on. “You shouldn’t have to ski in pain,” he explained, demonstrating the boots’ progressive buckles. “That’s what turns many people off from skiing on their first try.” Sure, but I seemed to remember my aversion to snow sports had less to do with my feet and more to do with my backside. I stomped around the store and practiced bending my knees while he grabbed the finishing touch: a beautiful pair of magenta Wagner skis made just down the street.“Have you ever skied before?” my instructor, Steve, asked as we stood in the fenced-off lesson area. “Once, when I was three,” I replied, glaring around at the toddler-aged pupils who seemed more comfortable on skis than I ever could be. With a genuine enthusiasm that I tried to match, Steve began at the very beginning—how to step into skis. All my suspicions were confirmed as I bounced up and down on my bindings, repeatedly failing to click in. This might be more difficult than Steve had expected. But despite my early reservations, skiing turned out to be surprisingly easy to pick up. Steve was a patient and methodical instructor, and I was gliding back and forth across the learner’s area in no time. We took on the short hill between Mountain Village and the base of the run and, miraculously, I stayed upright. Next, we followed an easy trail past the nearby Madeline Hotel, and the change of scenery made me feel like I’d graduated to the next level. Everywhere was blissfully empty. All my fears of somersaulting down bunny slopes, taking out everyone around me, and creating a massive pile-up of angry snowboarders quickly dissipated. As we shuffled through a lift line only two people deep, Steve explained that this lack of crowds was normal and that, in fact, January was actually one of the busiest times of year. I felt immediately protective, worrying that my newly discovered secret spot would soon be found out and become overcrowded. But I later found out that both the town and the resort are intentionally small, and—thanks to low-development zoning and the ski-loving resort owners—are going to stay that way. We’d been crisscrossing under the chairlift on my third or fourth time down the small slope when Steve looked over at me, smiling. “Wanna try some powder?” We veered off into the deep inches of fresh powder. Suddenly I felt like I was floating. Everything went quiet: My skis merely whispered against the snow and even the shouts coming from over the world’s smallest hill were muted. Filled with a bubble of exhilaration and joy, I finally “got” skiing. I understood why people around the world don a ridiculous amount of clothing, schlep unwieldy gear, battle traffic, and brave inclement weather for a few days of skiing. That feeling of flying is worth chasing. 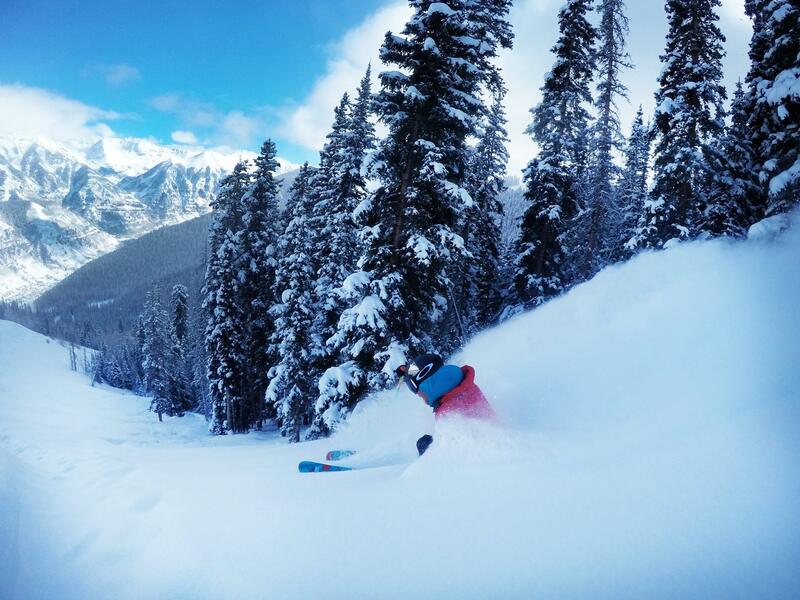 Expert skiers love Telluride because everywhere you look is skiable terrain. But even as an absolute beginner, I found a wealth of territory to enjoy, especially once I started doing real runs down the mountain. We’d start with an easy green circle trail, and then branch off onto a short double green with some simple bumps or drops to experiment on—or in my case, fall on. Once, we even veered onto a short blue square—yes, a blue square on my second day of skiing! I was elated and every new section of trail boosted my confidence and adrenaline. I couldn’t believe that I was skiing just like—well, just like people who actually ski. Almost as rewarding as this newfound addiction was my official introduction to the age-old tradition of après-ski. When the lifts shut down at 4 p.m. the doors of the bars and restaurants swing open. It’s finally time to kick back, raise a well-deserved glass of local craft beer or spiked hot cocoa, and toast to this heaven for people who love skiing—even if they don’t know it quite yet. >>Next: Which Snow Getaway Is Right for You? It’s easy to be nothing but smiles and full of excitement standing on top of Telluride on a day like this. It’s harder to feel that same way after a couple of hours of enjoying the snow if you haven’t done at least something to build some strength and endurance as you float and fly down the piste. If you’re not ready, it’s never too late to start. The main thing is to get up and move, hopefully for an hour or more, 4-5 days a week before showing up on the slopes. If group classes fit your temperament and schedule, join an aerobic, dance, fitness, or other class at a local gym. It doesn’t need to be a ski specific class, but try to find something that combines strength and aerobic conditioning, and make sure it includes lots of legwork. That may sound like Crossfit, but I don’t recommend beginning your fitness regime in such a demanding and competitive environment. Functional strength, so that your core and limbs are ready to keep you over your skis and to take you where you want to go. Interval training, so you can apply your fitness to the rhythm of skiing. This takes a bit of time. Try to get your endurance sessions up to at least an hour. This can range from a brisk walk to a run or bike, but aerobic endurance is built on longer less intense sessions. Since you will be breathing hard and challenging your leg strength on skis, choose an activity that builds and challenges both. Functional or core strength is important for almost any other movement. Building functional strength means increasing your ability to move with strength and agility, especially when moving over shifting and varied terrain. Lifting weights and doing planks and push-ups on bosu balls, swinging kettlebells and clubbells, rolling tractor tires, and flipping lengths of heavy sissel rope are all forms of functional training. These are good, but I’ve found you can build specific functional strength without going to the gym that also builds awareness and reactions I can use on the ski slopes even while walking and running. All I do is wave my arms around like a trance dancer at jam band concert as I walk, run, and even bike. This certainly looks weird, but I’ve discovered several benefits that outweigh (at least for me) the potential embarrassments. For starters, it takes away most of the pain I feel in my knees while running, especially while going downhill. I think that’s because I use my core, or the muscles of my trunk that connect my hips and shoulders, to avoid being flung from side to side as I wave my arms around. Each stride then comes from inside out as I direct each foot toward where it needs to be to keep me on course. As my foot lands, the entire chain of muscles, tendons and bones from foot to core is engaged and ready to absorb and redirect the energy of each footfall. I’ve found I can spend a few minutes finding my focus by waving my arms while running or walking and then take that that inside out focus back into running or walking without waving my arms around. I also do this on my bike, but would not recommend it unless you are already very very comfortable riding with no hands. And if you do try, you didn’t hear about it from me. The rhythm of higher end skiing requires short and intense burst of high intensity effort as you negotiate a mogul field or steep section, followed either by a break or a section of easier skiing. To prepare for this, be sure to include some interval training, which is working somewhat to very hard for a short amount of time, recovering for about the same amount of time, then doing it again. You can walk, run, cycle, climb stairs or do a wide variety of other workouts to this rhythm. These intervals can be structured based on time and/or distance, or you can simply choose hilly terrain and push up and recover down each hill. A simple way to get started is to find a hill where you go push hard for 3 minutes and then rest as you coast back down (on a bike or roller skis or roller blades) or jog lightly back to the beginning. Then do a 4-minute effort, followed by a 5-minute effort, finishing with a 4 and then a 3-minute push. Adjust your effort so the final 3-minute effort takes you as far or farther up the hill as your first 3-minute effort. If you’re short on time or can’t get out outside, you can do a high intensity body weight exercise programs to get your heart pumping and build strength you can use on the slopes. See http://well.blogs.nytimes.com/projects/workouts/ for body weight program you could do in your hotel rood and Google interval training for more ideas. All of the above are simply suggestions. Please don’t do anything that will hurt you or goes against what your doctor and your common sense tell you not to do. The bottom line is, you’ll have a lot more fun and be able to ski more and improve your skiing more if you do something to get ready for you time on the slopes. Start by getting up right now and walking around your desk or house. Then extend that into at least walking around the block a time or two tonight. After that do more each day until you’re putting in 30-60 minutes a day of activity. Sign up for a group class. Start swimming. Hire a personal trainer. Just do something! Do you feel or fear being out of control on more challenging terrain? If so, I bet you suffer from turning to slow instead of turning to go syndrome. Understand speed control: The tracks you leave in the snow trace a path that controls your speed by taking a longer route from top to bottom than going straight. To go slower, make more turns or tighter turns, or do both. If you want to go faster, follow a straighter path. Tip, then turn: You can only flop from turn to turn when you try to turn your skis before you tip them downhill. If you tip, then turn, you’ll be able to replace the desperate flop to get your skis back across the hill and dug into the snow as fast as possible with a flow from turn to turn. To flow instead of flop, start a new turn by moving your core toward where you want to go as you tip your feet downhill. This will roll your uphill edges out of the snow and flatten your bases against the snow. From this neutral position, it’s easy to tip and then turn your skis into the next turn and to flow forward into the next arc on a smooth and sinuous path of speed control. This is simple but not easy. It requires letting go of the natural tendency to lean uphill and away from the slope, an ability to tip your skis from edge to edge while staying over and moving with your feet, and knowing where you are going from turn to turn. I can help you understand, experience, and own these and other skills in daily lessons and specialty clinics throughout the season. Call now to book a lesson to learn to turn to go instead of to slow and to flow instead of flop from turn to turn. 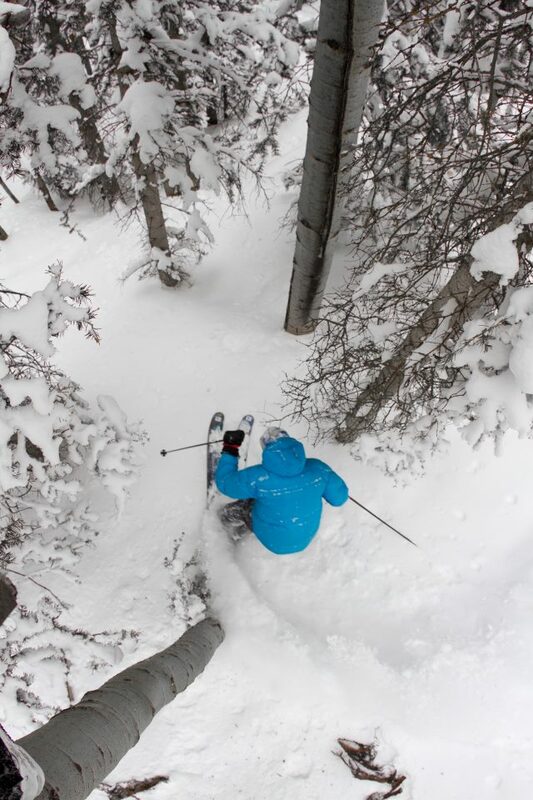 Join Steve to refine your powder skills with two days of coaching within the ski area followed by a day of backcountry helicopter skiing with Helitrax offered in conjunction with Helitrax and the Telluride Ski School. To reserve your spot with Steve for an upcoming Heli-camp, or to book a private lesson with Steve, please contact Phil Cummings at pcummings@telski.com or 970-728-7414. 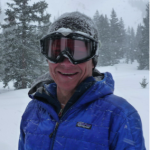 Steve Hindman is a top instructor for the Telluride Ski School, a veteran of the PSIA Nordic Demo Team, and has been a certified ski instructor for over 30 years. Why Ski with Steve? The simplest answer is because I want to ski with you. Sure, I fit in days when I “ski for me”, but sharing the pure joy of sliding around on snow with folks like you is what’s kept me skiing and instructing for more than thirty years. Over those years I’ve learned to watch, listen and feel to understand how I can help you get what you want out of each lesson and to achieve your potential on skis. Your goal might be to enjoy skiing and to get to know the mountain better with your family. It might be gaining confidence and control to move up to more challenging terrain. Perhaps you’ve always wanted to try skiing but have just made it to the mountains, so you are starting from scratch. Maybe you want to learn how to ski bumps, steeps, or powder, or you may be looking for a guide to help you enjoy Telluride. Regardless of your goals, I can take you, your children, and your friends to the runs that fit your level – from green to double black – and we will have an amazing time. These two things are simple to understand and tend not to vary much from person to person. What does differ is how each person hears, sees, thinks, and feels. To match your unique way of learning and perceiving, I draw from a toolkit I have developed through years of experience. I offer different ways to articulate the same concept, to demonstrate what I am saying, and provide drills to help you feel what I’m talking about. As I explain, demonstrate, and let you try it, I observe your skiing to see how you respond, and talk with you about what you have heard. My goal is to work with you to find an idea, a concept, or an experience that helps you get what you came to me to learn. I know I’ve succeeded when I see the smile on your face, the joy in your movements, and the glint in your eyes that tells me you’ve discovered your own passion for sliding on snow. Please Come Ski with Me! The key to floating instead of fighting the powder is turning to go instead of to slow. Turning to go controls your speed with a series of turns that keeps you moving at a consistent and comfortable speed along a serpentine path through the powder. Turning to slow is trying to control your speed one turn at a time. On groomed snow, you ski on the snow. 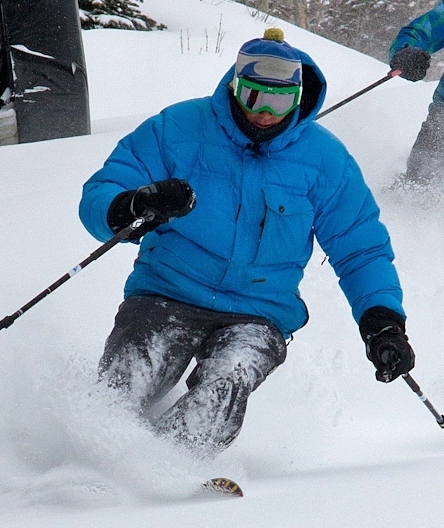 In powder, you ski in the snow. This requires a few adjustments. On a groomed slope, turning to go puts you on the edge of the outside ski as it bends and cuts a curved path through the snow. Turning to go in the powder is more of a three dimensional experience, where you ride through each turn on the base of both skis as they bend. This takes a narrower stance that weights both skis so they bend together into the turn. Skiing in the snow also slows you down, so you need to let go of the last turn and start the next one sooner to prevent your skis from sinking into the snow at the end of each turn, making the next turn much harder to begin. You also need to keep your skis flatter to the slope (edge or tip them less) to keep them from slicing into the snow, which also causes them to sink and stall. Learn to make these adjustments while traversing a gentle powder slope. After you build some speed, flex and extend to bow your skis into the snow. This should bring your tips out of the snow as your skis rebound from each compression. Move your body downhill and across your skis as your tips surface to make your first powder “turn to go”. This will tip both skis into the turn. As your tips turn downhill, extend your legs to help your skis bow into the turn. Be patient and trust the bow of your skis and the resistance of the snow to slow you down as you turn through and across the falline (the line that goes straight down the hill). Before your stall and sink into the snow, move your body downhill and across your skis to make your next turn. Resist the urge to quickly twist your skis as they point downhill, which will kill your speed and send you to the bottom, leaving you mired in the powder as you attempt to start the next turn. The timing is bring the tips up, move downhill and over your skis to start the next turn, then extend as you turn your feet, knees and thighs across the hill to guide the skis through the turn. Repeat before your skis turn very far across the hill. Tips rising just prior to the start of the next turn. Photographer: Tommy Pyatt. 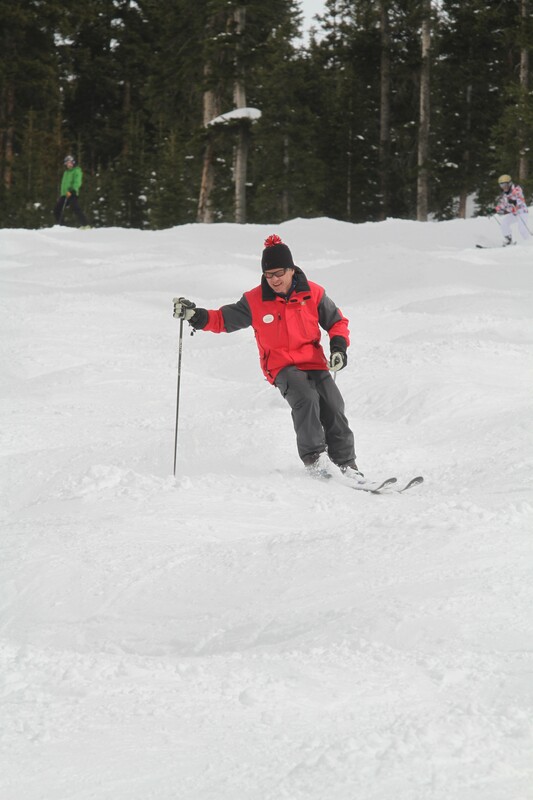 Skier: Vince Boelema. As you move to steeper slopes, experiment with how much flexion and extension you need to bow and release your skis, how far to turn across the falline to control your speed without stalling, and how much to tip and turn your legs and feet. Keep the triangle defined by your belly button and shoulder pointed toward the bottom of the hill by turning your pants (your legs) more than your jacket (your upper body). If you keep going over the handlebars, don’t tip and turn so much, or don’t tip and turn all at once. And for heaven’s sake, don’t sit back – there’s simply no need to with today’s equipment. Skier supported over the middle of the skis, skis turning while the upper body faces the next turn, pole in motion to begin moving to the next turn. Photographer: Tommy Pyatt. Skier: Vince Boelema.